Morena moteada. Maldivas. - Global: Tímidas y cegatas, las morenas llegan a medir hasta 2 metros. (Gymnothorax tessellata). Black-spotted moray. Maldives. 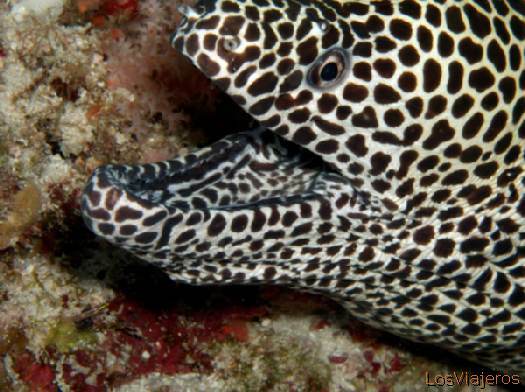 - Global: Very timid and almost blind, moray eels can grow up to 2 meters long. (Gymnothorax tessellata). Morena pintada. Maldivas. Yellow-margined moray. Maldives.